This Wrought Iron Art Deco Stand or Pedestal is no longer available. Wrought iron stand. Stripped of paint. Could be used with marble top (top in picture is an example and is not included) as a console in combination with wrought iron mirror. This object should be seen as a restoration project. Very interesting wrought-iron chenets, circa 1900, with some very artistic detaills. Distinguist cast-iron gilded coffee-table with marble top, probably designed by the French artist Raymond Subes. 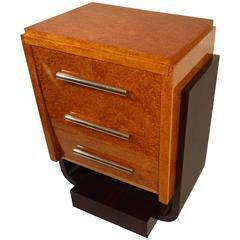 Amazing Art Deco dresser in a marriage of rosewood and silverbirch-buttveneer. Fully restored and in a perfect condition. High-quality vitrine cabinet in solid oak, in the style of Charles Moreux. 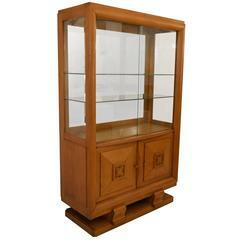 This vitrine with two glass-sliding doors is in a very good original condition. 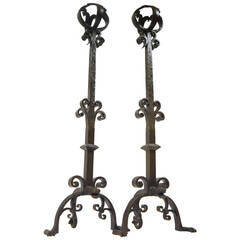 A pair of iron scrolled stands with a nicely burnished look, the twisted central stems set on tripod bases. Molded fiberglass drum. Possibly circus prop or display piece. Striking and raw Brutalist pedestal plant stand in torch-cut copper. The rugged edges of the open work create an imposing silhouette. Artist made in the 1970s.